Unicorns are likely to be at the forefront of the imagination in your little girl’s mind. Instead of just having to imagine what it would be like to play with unicorns, kids are now given the chance to really do so. There are so many unicorn toys available that it can be hard determining which ones are best. That’s why we’ve researched and put together a review of what the best unicorn toys for girls have to offer. These types of toys make great gifts for all little girls whether it be for Christmas or as a birthday present. One of the biggest benefits to letting girls play with unicorn toys is that it sparks their imagination. In fact, it lets their creativity run wild. The more kids are able to stimulate their imaginative side, the more they’re able to develop. This can help to improve creative thinking too. Interestingly enough, even adults have come to be fascinated by unicorns when watching their children play with them. We’ve included some very entertaining unicorn toys below that both parents and kids can have fun with and experience quality bonding time. So, take a look below to pick out the best unicorn toys for your child. Jellycat was founded in 1999 and ever since they’ve created original soft toys that kids have been loving. Their Ursula Unicorn toy is no different. It has been created with soft plush material which feels great for kids to cuddle with. The cute design of this toy is something that children have been loving. It can be a fantastic addition to their unicorn toy collection too. Children are able to expand their imagination by implementing this simple unicorn toy into their play time. Ages 12 months and over. 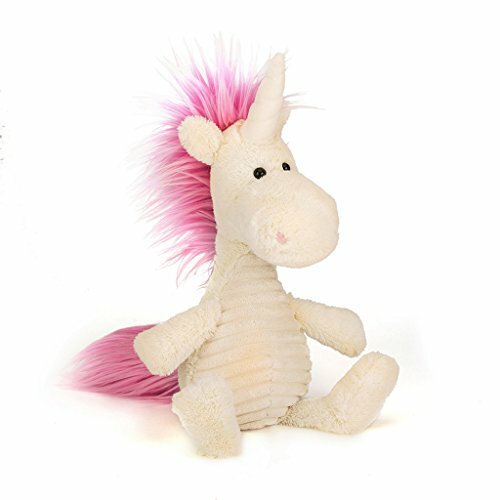 The soft materials and cute design of the Ursula Unicorn by Jellycat is something that kids have been appreciating. Since it can be so easily used along with other toys, the creative side of children is enhanced. Posh Peanut’s Golden toy hat is awesome for wearing at any party or fun event. The headband is super easy to put on and take off. Therefore, your child can wear it to parties or even just get-togethers with their friends. We liked how you can easily take this unicorn party hat with you on journeys too. It’s awesome for keeping kids entertained during car or airplane journeys. When children wear this hat, they feel like they’re a unicorn. Therefore, it’s effective at sparking your child’s imagination. Parents are liking how such a simple hat can keep children entertained for so long. Moreover, it’s comfortable and makes your child feel special! Ages 4 months and over. When kids play with unicorn toys, they’re creating scenarios for them. But when they wear this hat, they put themselves in the shoes of a unicorn. This can be a very fun imaginative exercise that parents can get heavily involved in. 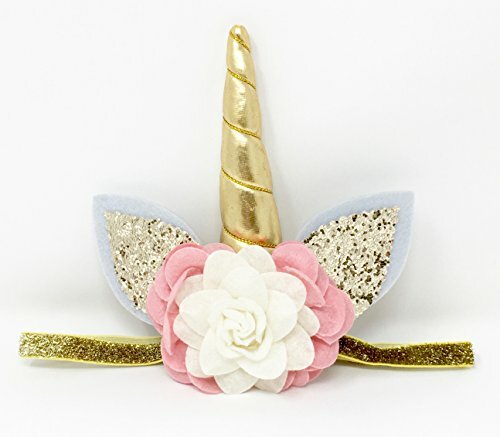 GUND’s Lily Rose unicorn toy comes with accents that have been trimmed with gold. The mane also has an excellent flower accent. These features all add up to leave you with one incredibly cute looking unicorn toy. The plush materials used make it very soft and cuddly. Children are able to incorporate this toy into their collection. As a result, they can use it along with their other toys which provide them with more opportunities to expand their creative thinking. Parents will be pleased to discover that they can easily wash the surface of this toy! This makes for hassle-free maintenance. 36 months to 5-years old. The attention to detail with the GUND unicorn toy is remarkable. With the gold trimmed accents and flower accent on the mane, this toy looks very cute. This visual design is also stimulating for younger kids. Aurora World’s Dreaming of You has created a toy that comes with a lot of great design features. The main reasons it made into our list of the 26 best unicorn toys for girls is because of the fluffy mane, trimmed hooves, and sparkly horn. Moreover, the soft plush materials have been polished to leave a very clean finish. With such a sparkly design, children’s visual senses are stimulated. This can help to boost their creative thinking. We also liked how soft the plush materials are. They make the toy a great choice for kids who like to cuddle. The eyes have a lock washer feature. This ensures they can’t come loose and become a safety hazard. 36 months to 15-years old. The fluffy mane, sparkly horn, and trimmed hooves provide children with a lot to look at and interact with. As a result, using this toy along with their others is a great way to develop their creative side. We liked how this unicorn toy comes with a slap bracelet. This adds another element of fun to the unicorn toy that kids are very amused by. 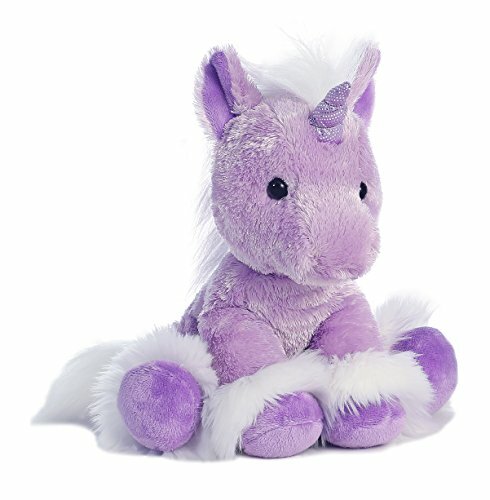 If your child is a hugger, they’ll fall in love with how soft the Wild Republic’s unicorn toy is. It has been made with incredibly soft plush materials – making them the perfect hugging companion. Children are able to play with the bracelet and unicorn for hours on end. You can wash the surface of this toy too. This makes the cleaning process a breeze. The addition of a slap-on bracelet is a creative add-on that kids are loving. It provides them with something else to play with in case they ever get bored of the toy on its own. 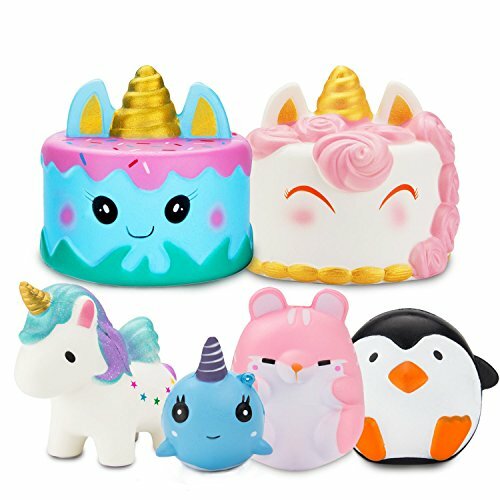 This set of unicorn mousse scented squishy toys is pretty unique, to say the least. These mousse pieces can be squished and played with for physical stimulation. The smells they give off are also very pleasant. They’ve been a big hit when it comes to parties. Their small and lightweight design means that all children can play with them. 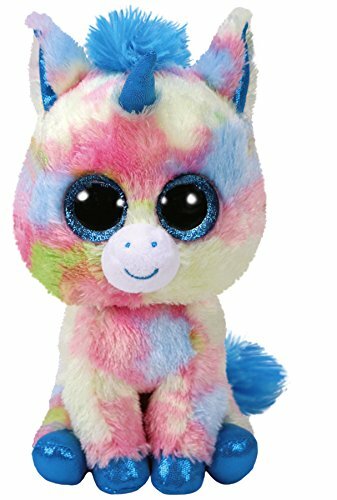 We also like how kids can squish these unicorn toys as a way of relieving any irritation and emotions that they’re holding back. In addition to this, they also help to strengthen the finger muscles. All of the materials used are also safe for the environment and are safe for children. These squishy toys are very different compared to many of the other unicorn toys available. But that’s what makes them so special. Kids love holding onto them and squeezing them. It helps their finger strength to develop while also helping them vent any emotions. 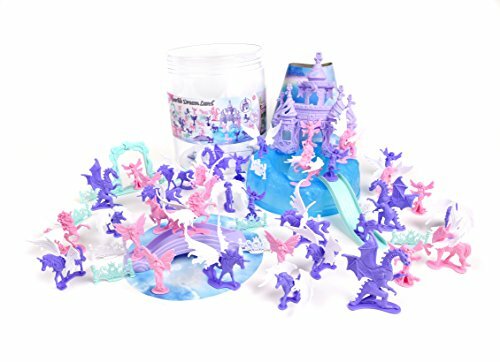 Sunny Days’ Unicorn play set comes with a bucket. This makes it super easy to store all the figure once your child is done playing with them. The bucket container also makes taking these toys with you while on the move easy. The colors of the toys include lavender, pink, purple, and turquoise. As a result, kids are given the chance to develop their color differentiation skills. In addition to the unicorn, there are also fairies, castles, and dragons. This provides your child with a lot of toys to play with. We liked this feature as it allows them to expand their imagination further. 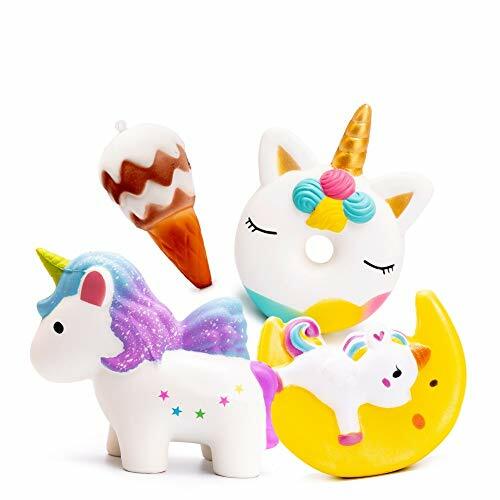 The wider range of toys available with this unicorn set is awesome for encouraging children to play with more creativity. With dragons, fairies, castles, and unicorns, they’re able to stimulate their creative storytelling skills. 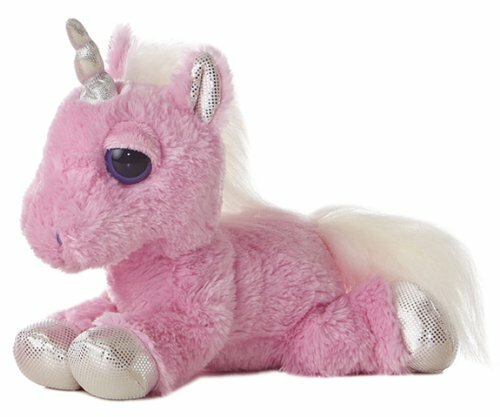 This unicorn toy by Aurora World has been designed with very soft plush materials. This makes it very easy to cuddle for younger kids. There is a variety of colors used to design this toy. They include punk, purple, yellow, and bright blue. This is fantastic for stimulating your child’s mind to differentiate between the various colors. These colors also add to the cuteness factor. As a result, children love keeping this unicorn toy close to them a lot of the time. 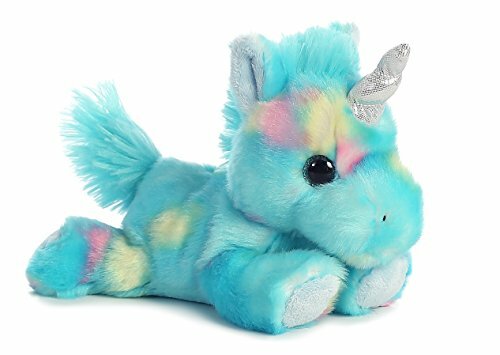 Children are drawn to how soft, cuddly, and colorful this unicorn toy is. The different colors help to develop their color differentiation skills too. 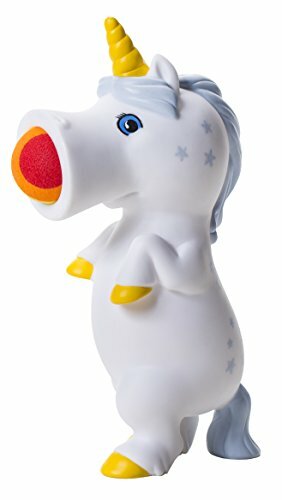 The Pooping Unicorn by Squatty Potty Dookie is one of the more entertaining unicorn toys that adults and kids have been having a lot of fun with. It has a cute design which is attractive to kids. However, it also shows them the correct position for squatting to use the loo. So, while you and your kid will be laughing away at watching the unicorn do its business, you can also use it as an opportunity to teach your child the correct positions for doing the same. It goes without saying, this is an odd unicorn toy. However, it’s proven to be one of the best unicorn toys for girls due to how entertaining it is to play with. As a parent, you’ll be laughing along with your child which is great for bonding. Furthermore, you can use the toy to teach your kid potty training. 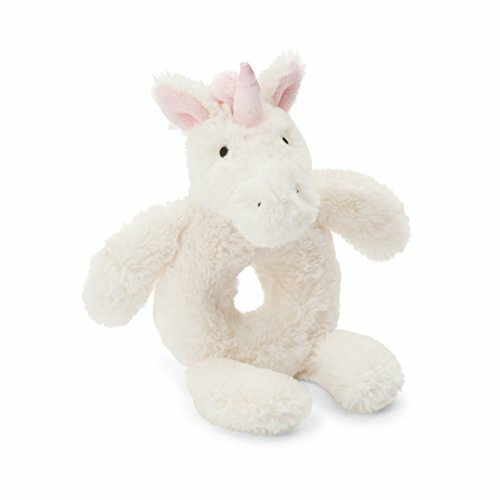 The remarkably soft design of this unicorn toy by Mary Meyer is one of the most notable features that kids are loving. This is because the soft feel makes the toy very huggable. 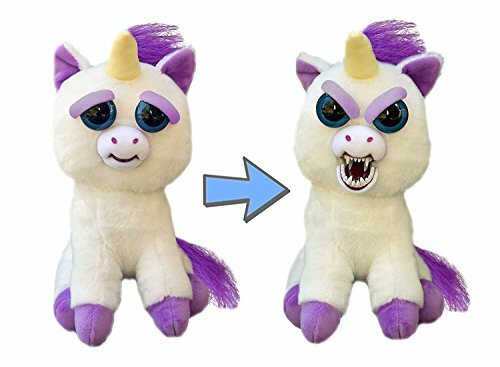 Children love holding on this unicorn toy and squeezing it. Parents have been glad to find that you can simply throw this toy into the washing machine on a gentle cycle. It can then be air dried. This makes the cleaning process super easy! Mary Meyer has also ensured this toy exceeds the safety standards for toys in the US. So, you’re given the added assurance that it’s safe for your kids. Mary Meyer has manufactured a toy that’s very soft and huggable. This encourages children to hold the toy and develop their grip strength and sensory abilities. 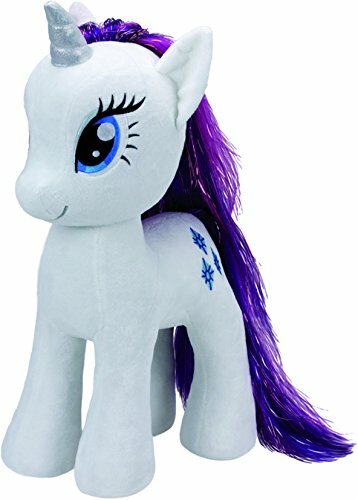 The Blitz Beanie Boos unicorn doll toy has a spectacular design. It comes with Ty heart tags which look great. This unicorn toy is part of a large collection of Beanie Boos toys. Therefore, children are able to add to the collection over time. As a result, they can play with a variety of toys to spark their creative side. Parents have also been delighted to report that there’s minimal care required to maintain this toy. 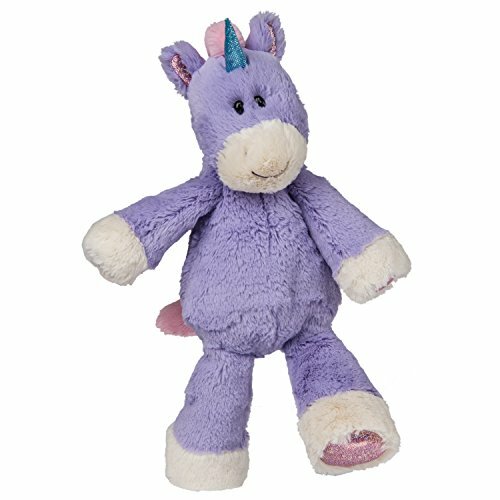 Since this unicorn Beanie Boos toy is part of a collection, your child is able to add more to their toys over time. This helps them to develop imaginative play scenarios. It’s also a good way to teach them patience as you can buy toys to add to their collection over time. If your child is a big fan of unicorns and roleplaying, they’ll be over the moon with this unicorn toy set. It includes a castle which has a total of five different windows. The position and size of the windows make them perfect for putting the unicorn toy in any one of them. This is a fantastic way to help children create stories to boost their creative thinking. We also liked how the colors of the unicorns are very bright and vivid. This makes them more enticing for kids to play with. They’ve been made with soft plush materials which are great for cuddling with. Parents have said that their kids are occupied with their unicorn castle set for hours. The castle feature is great for more than just providing a more imaginative playing area. It can also be used as a carrying case for all the pieces, which makes it great for traveling. This playset provides children with more inspiration to come up with their own ideas on how to play more creatively. Moreover, the portable feature is fantastic if you’re on the move and need to keep kids occupied. Paip Bobo’s Jumbo Squishy unicorn toys are super soft. This is a result of the PU foam materials that have been used. They provide the toys with a velvety and soft feel. These materials are also toxin-free, durable, and lightweight. The squishy nature of these toys can make them awesome stress relievers for kids. Furthermore, their smaller size enables you to take them with you wherever you go. They can be a fantastic outlet for children to reduce any anxiety they may have. With a colorful design, children are able to develop their skills of taking in information visually. You can easily pack these squishy toys with you to keep children entertained while on the road. They’re also useful for strengthening their grip strength. Moreover, they can be effective at relieving stress – parents actually like using these toys too! 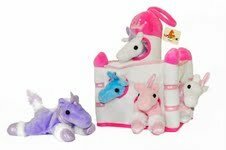 GUND’s Princess Castle playset comes with a plush stuffed unicorn. The castle is a great addition that helps your child explore their imaginative side. We especially liked how the unicorn creates sounds. This makes it incredibly interactive and fun to play with. There is a total of five pieces available. This includes the castle, unicorn toy, a carrying case, fasteners, and purple accents. We liked how the carrying case has been designed with pink glitter sparkles. 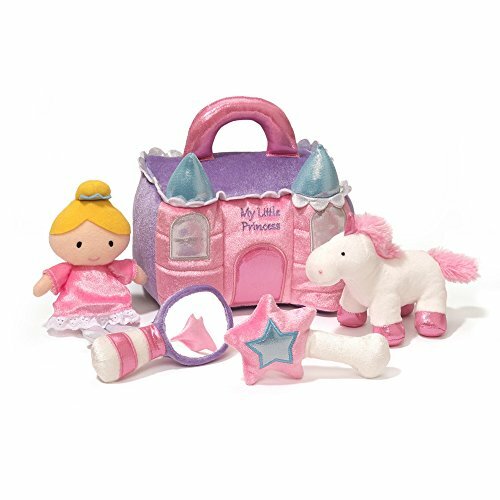 Within the carrying case, there’s a magical mirror, princess doll, and wand. This carrying case also means that you can easily take this toy set with you on your travels to keep kids entertained. Parents are also fans of how the surfaces of the different items can be easily washed. The unicorn with this toy set makes sounds, which kids find very entertaining. This is an awesome way to help them develop their audible learning skills. There are so many different pieces available in this toy set – you can be sure kids will never get bored with it. 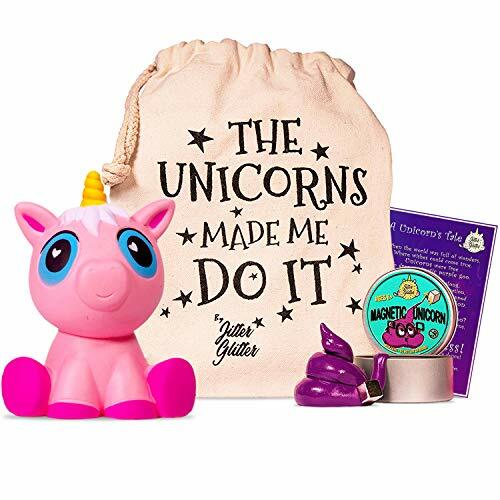 Magnetic’s Putty Unicorn Poop Stress Relief Kit is super fun and helpful for kids going through potty training. The materials are stretchable and can be molded. They can also be bounced! This ensures that kids are able to have plenty of fun. This unicorn toy is also very squishy. Therefore, it’s great to hold in order to relieve stress. It comes with a drawstring bag that’s been made out of cotton materials. This makes it effortless to store various accessories while on the go. Parents have been liking how fun this putty unicorn toy is. You can have a lot of fun with your kids playing with this putty. Since this putty can be molded, children are able to get very creative and make a wide variety of shapes. This will also keep them engaged for a long time. 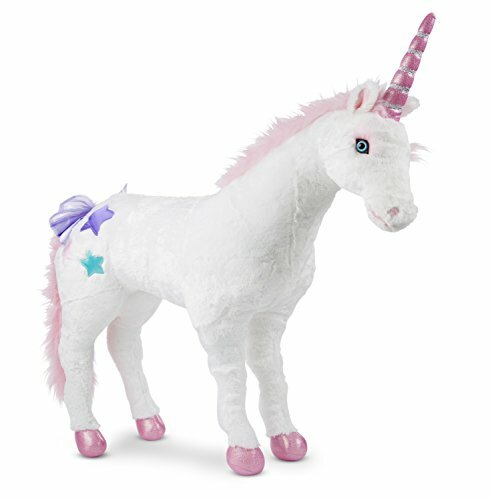 Melissa & Doug has designed an awesome unicorn stuffed animal toy that can become a part of a child’s toy collection. The mane and tail are pink, which girls have been loving. There are also strands of shiny silver across the unicorn that are highlighted in the brighter environments. All of these design features combined make for a design that stimulates the minds of kids. Furthermore, the fur has been made out of silky plush materials. As a result, the unicorn feels incredibly satisfying to touch. So, their touch senses are also being stimulated. 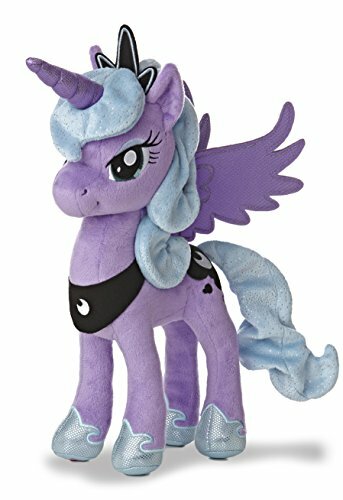 My Little Pony is a well-established brand that has come out with a unicorn plush toy. We liked how the mane and tail have flowing wisps made with metallic materials. These add a shine to the toy which looks more exciting. Furthermore, there are diamonds on the hip and the eyes are large. Not to mention, the horn is covered in glitters to add a magical effect. All these design features encourage children to get creative with how they play. The materials are polyester fiber fur. They’re incredibly soft and silky smooth to the touch. 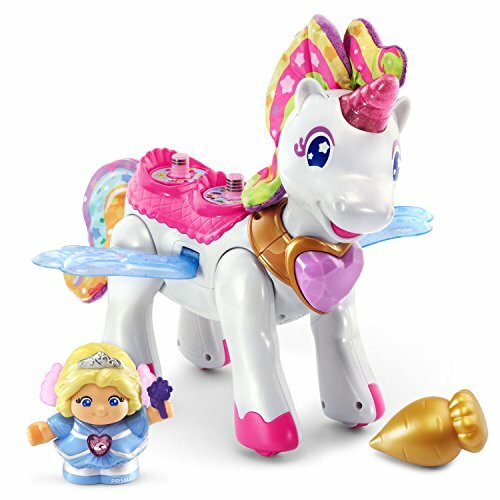 If your child is a fan of the My Little Pony TV show, they’ll adore this unicorn toy. They may recreate scenes that they remember from the show, which is a great way of developing their cognitive abilities. The toy is packed with colorful glitter and strands that look visually appealing. They also help to spark excitement and imagination in your child. The polyester fiber fur is also remarkably soft and comfortable to cuddle. These unicorns have been created with a very specific design. Pink wings, a rainbow-colored main, and golden horn are all very colorful and bright. They stand out even more due to the white color of the body. We also liked how all the materials used follow the guidelines set by the child safety standards in the US. 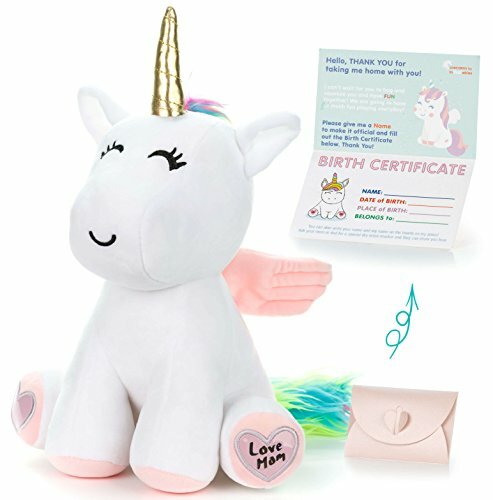 The paws on this unicorn toy have a unique paw design that allows you to write small messages on them. This is a fun way for children to learn how to write and spell words in a fun way. Children and parents are loving how they can write short messages on the paws. It provides parents with a fun way to help children develop their writing and reading abilities. 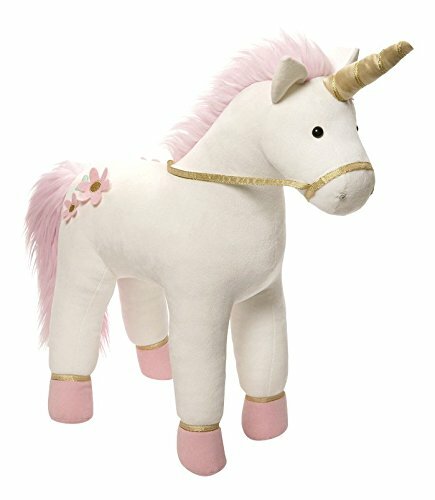 This unicorn toy from Aurora World comes with a fantastic embroidery feature. This enhances the details of the face and adds a great visual flair. The fabric can be dyed to your color preference, which is an awesome customization feature. With fabrics that shimmer, children are able to stimulate their visual senses. Moreover, there are very soft plush materials used. These make the unicorn easy to handle and cuddle. A tag is available which describes the unicorn. We liked this feature as it provides kids with some background on their toy which they can then build off of during their playtime. It’s also a good way to encourage reading. With an embroidery design and shimmering fabrics, children are drawn to the vivid designs. This helps to activate their visual senses. With a tag providing information about the unicorn, children are also able to get creative and make their own stories about the toy. 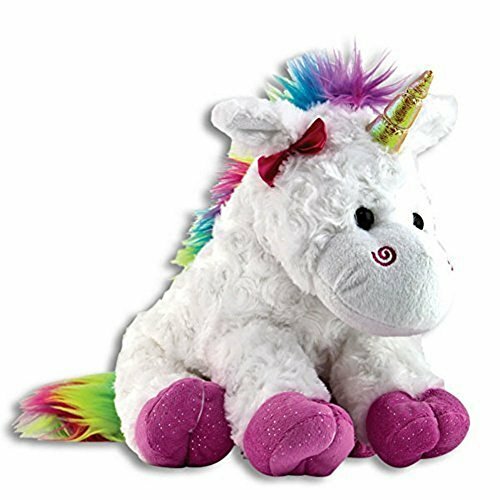 Kids have been loving how soft this rainbow unicorn feels. 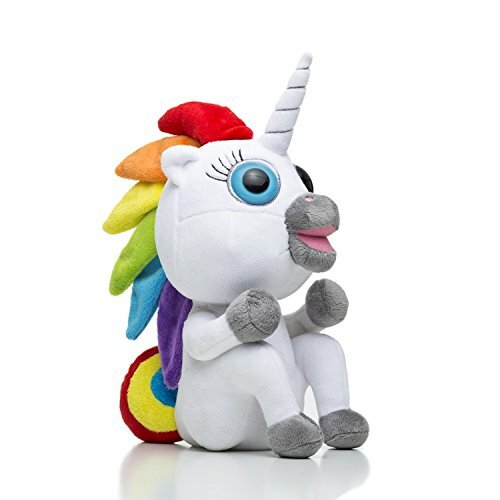 So, if you have children who are hug-fanatics, this unicorn toy would suit them well. We liked the rainbow design because it’s super colorful and can help to spark the creative side of kids. In addition to this, the hooves and horn are sparkly, which adds even more of a colorful flare. You can easily maintain this toy too by simply cleaning it with water and soap. With a rainbow design and sparkly hooves and horn, kids will be drawn to the bright colors. They also promote a sense of excitement, which kids pick up on well. They can also improve their skills when it comes to differentiating different colors. If you have a small child who’s becoming very active with her hands, this unicorn ring rattle could be just what she needs. It’s made out of soft materials which makes it a perfect cuddle buddy. The main reason kids love it, however, is because they can move it around to create lots of noise! They can hold the rattle and keep their hands busy while stimulating their audible senses. Parents often leave this unicorn ring rattle in the crib and babies are able to have plenty of fun for hours. The more time they spend with it, the better their grip abilities become too. 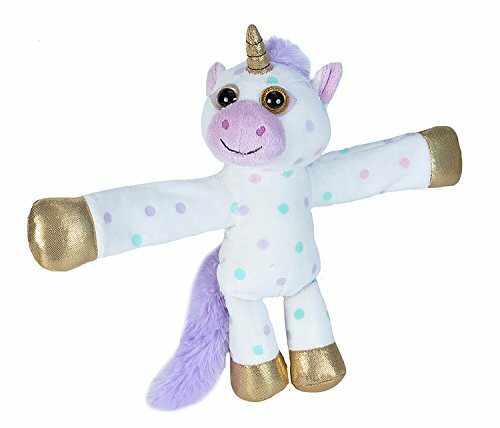 Kids who are always looking for something to hold will make the most use out of this unicorn toy. We liked how it’s a fun way for them to develop their grip strength too. The Glenda Unicorn toy is incredibly interactive. When you squeeze the area behind its ears, it makes noises. These noises can vary from cute, to angry – hence the feisty part. It’s pretty entertaining to see kids responding to the toy’s reaction. With soft polyester fibers, you can be sure that children will be occupied holding onto this toy a lot. Moreover, the surface of it can be easily washed for simple maintenance. The interactive noises are a lot of fun to play around with. They also enable kids to develop their cognitive and sensory skills. When they squeeze behind the ears, they’ll be able to anticipate the response. Hog Wild’s Unicorn Popper is another highly interactive unicorn toy. When you squeeze the toy in the middle, a soft foam ball shoots out – it can reach up to 20 feet! The harder you squeeze the center of this toy, the further and faster the ball will come out. Therefore, this is an awesome toy that can help your child develop their strength and grip abilities. There are six soft foam balls available, as well as a net for storing the balls. We also liked how the balls have a brightly colored orange design. Children are able to improve their strength and grip abilities with this toy. You can encourage them to try and get the ball to travel further, which increases their strength over time. It’s also a lot of fun to play with the whole family. The Vtech Go! Go! is one of the most interactive unicorn toys in our review. By pressing the various buttons, the unicorn will flap her wings while also moving her head and walking forwards! With a golden carrot accessory item, children are able to use the unicorn in more imaginative ways. color and light up is a fantastic way for their visual abilities to be stimulated. Not to mention, the phrases it says help kids learn in a fun way. Aurora World’s Dreamy Eyes Heavenly Pink toy has a very cute face. This is a result of the sleepy eyes design. We liked how the eyes have a lock-washer design as it ensures complete safety for your child. Children have been drawn to this cute design and love adding it as a part of their toy collection. Soft plush materials have been used to make it too. This makes it very easy to cuddle for kids. The size of this toy also makes it a fantastic option if you’re traveling. 36 months – 5 years old. The unique sleepy eyes design of this toy makes it a very cute toy. Kids are also able to stay entertained and cuddle it while traveling due to its smaller size and soft materials. This unicorn horse rocker toy is one of the best options in our review that helps kids develop the muscles in their arms and core. While sitting on the rocker and moving backward and forwards, their balance abilities are also improved. Even climbing on and off this unicorn rocker requires them to develop strength in their arms and legs. Once they’re on the unicorn, they can have a whale of a time rocking back and forth. You can be assured of their safety because of the seat design. They’ve created it especially for kids who are still working on their balance skills. The racks have also been stuffed with cotton. Therefore, putting their weight into it won’t cause any discomfort. We liked how the structure has been made with medium density fiber and strong wood materials. All of the materials have been passed by the Toy Safety Standards in the U.S. for your peace of mind. 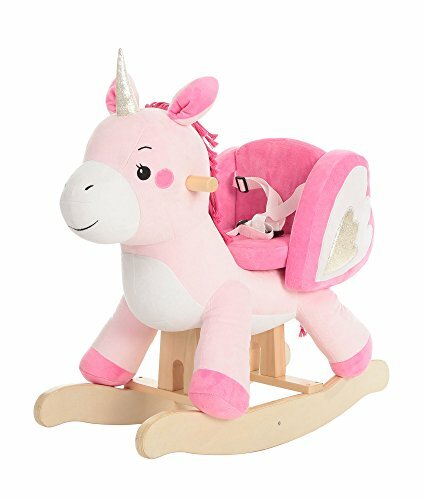 This unicorn rocker toy is an excellent choice that helps your child to develop their balance and strength. In particular, their core, arms, and legs are able to become stronger. Years ago, the main purpose of toys was to keep kids busy. However, toy companies nowadays are able to manufacture toys that enable your child to learn while also having fun. On the surface, unicorn toys may not seem like they have a lot to offer in terms of learning and development but the opposite is quite true. Due to the interactive nature of the unicorn toys mentioned above, children are exposed to learning more about animals, colors, and shapes. As a result, their learning skills are given a boost. One of the main ways that unicorn toys can help a child develop surrounds their creative side. The right side of the brain is the part that deals with imaginative thinking and arts. Developing this side of the brain is vital for ensuring your child is able to come up with imaginative ideas. This can translate very well over to problem-solving skills and being able to think outside of the box. This is where both sides of the brain are able to work cohesively as a unit. It allows kids to combine their more logical and creative thinking processes. Picking toys that have interactive features is a great way for kids who are around one years old to develop their social skills. When they’re able to interact with a toy, it teaches them how to interact with their environment. The toys that include sounds, lights, or phrases/storytelling modes are best for developing a child’s social skills. They’re able to communicate and understand the information that the toy is providing them with. This can have a huge impact on how well they notice their environment. As a result, when they’re in social situations later in life, their communication skills will be advanced enough to interact with bigger groups. A child’s cognitive abilities are one of the most important skills for them to develop. Playing with toys from a young age is an effective way to ensure they have a better understanding of how things work. For example, pressing a button on a toy and hearing it make a sound in response provides them with more than just entertainment. They begin to understand that whenever they press that button, the toy will make a sound. This is a fundamental skill to have going forwards when it comes to being better at learning. Sensory skills include anything involving shapes, colors, and any audible information. The unicorn toys above are awesome at helping children develop their sensory skills. There are different colors, textures, and shapes for them to experience. Playing with these toys is a great way for them to learn how to differentiate between different colors, shapes, sounds, and textures. Motor skills are basic learning steps that children experience by simply moving around. Since these unicorn toys require kids to hold onto them and move them around, their motor skills are able to advance. Developing their fine motor skills takes it a step further. This involves improving the smaller details, such as their grip strength. The unicorn toys in our review allow kids to hold onto them and play in intricate ways that enhance their fine motor skills. As you’ve seen throughout our review of the 26 best unicorn toys for girls, we’ve provided you with the recommended age ranges that each toy is suitable for. The different toys have different developmental benefits that are best suited to a certain age range. Younger children tend to be more happy playing with the simpler toys. However, when kids start to become older, they begin paying attention more to the smaller details of their toys. While the age ranges that we’ve laid out for each toy are good guidelines, they are simply recommendations. Having said that, it’s good to be mindful of them in regard to your child’s age. Some of the toys may be a little too advanced for children below the recommended age range. On the flip side, there could be toys that are too simple for an older child. So, ultimately, it comes down to your parental judgment on what you think is best. Even if toys have passed all the safety standard regulations, there are still some hazards that you should always be on the lookout for. Smaller children tend to put things in their mouth without you even realizing. This can be an especially dangerous hazard with toys. Unicorn toys don’t tend to have smaller pieces. However, there are parts that can fall off. If you find toys that have had parts fall off or are loose, it’s best to fix or replace them. Toys that are easy to clean is a big bonus. This makes it simpler for you to reduce any chances of bacteria building up and causing harm to your child. The imaginative play factor was a big one for us to consider. Unicorns are mythical creatures which, by nature, inspired creative thoughts. Be sure to use our best toy unicorns for girls guide to help you decide which one is best for your child!